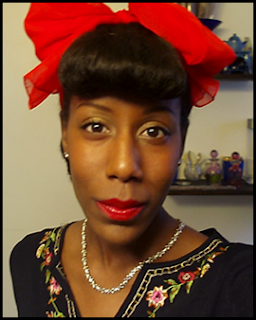 & I am honored to feature her for this week's "A Hair Story". She was so kind to let me interview her on her lovely Hair Journey. Feel free to reach her through her Youtube Channel, or Twitter. CurlyChronicles: I've been natural since 2003, my 8 year anniversary was in March! CurlyChronicles: I had thin, dyed hair but it wasn't permed, it just mimicked permed hair so I cut off most of it and opted for little fro before putting in two strand twist extensions. CurlyChronicles: I would 4a with fine strands but it's very dense/thick! CurlyChronicles: I've always admired natural hair but it wasn't something I saw often when I was younger. I'm completely in love with it now and I still adore straight hair styles because while natural hair is beautiful so is everyone else's. CurlyChronicles: I definitely think my confidence increased. I was always worried about my hair when it was straight and constantly wondering when I could get back to the house to revive it or back to my dorm room before I went down to eat dinner with friends. I don't think much about it anymore except for maybe a big affair but I think anyone regardless of texture deals with that..just a part of wanting to look your best. CurlyChronicles: These are the common ones..
CurlyChronicles: I usually wash and condition nowadays but only because I use a bit more product than before so the buildup builds up quickly! I think my favorite style is probably one that incorporates 30s styled waves..one of the more recent tutorials I've posted. It's a classic kinda 'do and it's not all over the place..it stays where it's supposed to! Natural Expression: What are some of the challenges you've had with your natural hair? 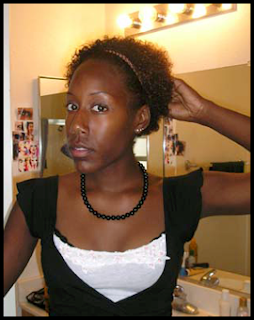 Have you ever regretted going natural? CurlyChronicles: I've never regretted it..it's always been a great decision, even if I don't remind myself of it often, the people I interact with surely will tell me so. The only challenge I have is with preventing knots. They're just always...there. I don't really worry about them too much though, they don't hinder my styling methods/outcomes really so I guess que sera, sera! Natural Expression: What have you learned about your hair? What mistakes have you made? CurlyChronicles: I've learned to go with the flow more. I always resisted my hair in the past but I work with it now and we have a lovely relationship. I've caused breakage from too much brushing or tension from pony tails, I've blown it out a bit too often and noticed stringy pieces..probably things that others have encountered as well. So I'm mindful and try to make sure I'm not doing more damage than good. CurlyChronicles: Oh, shameless self promoting! I'm all over the place it seems! 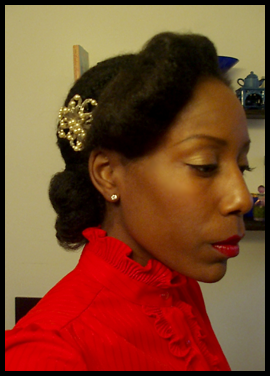 I've got a fun new blog about vintage inspired natural hair styling located at www.theretronatural.blogspot.com. 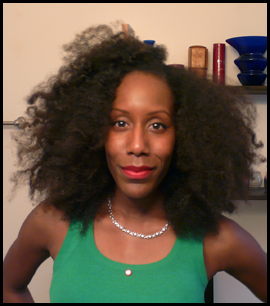 I'm also on twitter, @curlychronicles & Facebook (CurlyChronicles). Natural Expression: Would you like to add anything, feel free! CurlyChronicles: Enjoy your hair and have fun with it! Great interview and great hair! !